Thai's WBA World Minimumweight champion Thammanoon Niyomtrong (Knockout Cp Freshmart) is set to defend his title against the Filipino Toto Landero on December 15, 2017. Thammanoon Niyomtrong is a 27 years old from Surin, Thailand. He has a record consisting of 16 wins and 7 victories by way of KO. Niyomtrong is currently ranked no. 1 in the world in the minimumweight division and he is a world champion since last year. Niyomtrong won the WBA World Minimumweight Title against Byron Rojas via unanimous decision and successfully defended it 3 times. In his last fight, Knockout Cp Freshmart defeated the Filipino Rey Loreto via unanimous decision. 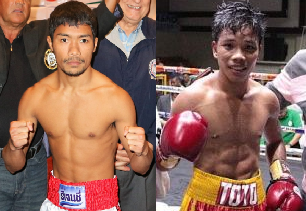 On the other hand, Toto Landero is a 22 years old boxer from Pontevedra, Negros Occidental, Philippines. He has a record of 10 wins including 2 victories by way of KO and has 1 defeat and 2 draws. Landero is really an underdog in this fight and he will be fighting outside of the Philippines for the first time. Thammanoon Niyomtrong vs Landero will be held in Thailand.